I was born in Morocco in 1936. When I was eleven, I set out by horse-drawn cart to Casablanca, where I studied in the Chabad yeshivah for two years. But I wasn’t happy; I was looking for something more rigorous. I learned that the Rebbe’s first emissary to Morocco, Rabbi Michoel Lipsker, had come to Meknes and opened another yeshivah there. In Meknes, I found what I had been looking for – a more intensive program of studying Talmud and chasidic teachings. Rabbi Lipsker also taught me (and all his students) how to bring Jews closer to G-d through love. In 1952, after two years of studying at the yeshivah in Meknes, I moved on to study in the Tomchei Temimim yeshivah in Brunoy, France. This yeshivah was founded after World War Two with the arrival of many Chabad refugees from Russia. In addition to delving into advanced chasidic texts, every Sunday we would travel to Paris to teach Jewish children there. These children studied in secular public schools all over Paris, but on Sundays, Rabbi Hillel Azimov, the Rebbe’s emissary in the city, would gather them together, and the yeshivah students would learn with them. One year, as part of the celebration of Lag B’Omer, we rented busses and brought about two hundred of these Sephardi children to spend a whole day in the yeshivah in Brunoy. The children prayed with us, ate with us and soaked up the spirit of the yeshivah. After seven years of studying in the yeshivah in Brunoy, I came to study in New York. In those days, each yeshivah student would have a private audience with the Rebbe on their birthday. But, in Morocco nobody attributed any importance to birthdays, so I didn’t even know my exact date of birth – I only knew that it was somewhere around Purim; nonetheless I took advantage of the opportunity to see the Rebbe. As soon as I entered his office, the Rebbe asked me on what day I was born. I didn’t know how to answer, so the Rebbe said to me, “Since you don’t know, and being that Shabbat is holier than the other days of the week, let’s set this Shabbat as your birthday. Study extra Torah as is customary on a birthday, and regarding the custom of giving extra charity, you should give on Friday before the onset of Shabbat.” And then the Rebbe blessed me with success in my Torah studies. Afterwards, I wrote home, asking my parents to tell me the exact date of my birth. It turned out that, indeed, that Shabbat was my birthday! After a few more years of study in the Chabad yeshivah, I was sent as the Rebbe’s emissary to serve as the rabbi of the Sephardic community of Milan. The Rebbe chose me for this position because I hadn’t abandoned the Sephardic customs of my Moroccan family. The fact that this was so had a lot to do with the Rebbe’s instructions to Rabbi Lipsker, many years earlier, not to try to alter the customs of Moroccan Jews but just to teach them Torah. When Mr. Zippel returned to Milan, he asked me to come by his office and handed me an envelope containing a substantial sum of money. And then he told me what the Rebbe had said. 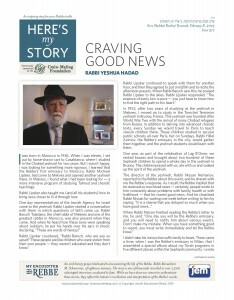 I understood – the Rebbe took care of all the details pertaining to his chasidim, like a real father. Rabbi Yeshua Hadad (1936-2017) served as a community rabbi in Milan for over fifty years. He was interviewed in Jerusalem in August of 2012.